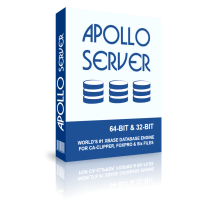 The Apollo Server is an optional backend database server for providing remote access over TCP/IP to CA-Clipper, FoxPro 2.6 and Apollo databases. It is an ideal solution for building client/server applications. Developers use Apollo Embedded to create stand-alone applications that can manage data locally, or with Apollo Server, can run in client/server mode in only 5 lines of code! Simply set the IP address, port #, user name and password in your Apollo application. Apollo Server Unlimited support an unlimited number of concurrent client connections. The free 2-User edition supports up to 2 concurrent users, which is ideal for testing and for simple access to remote DBF/Xbase database files over TCP/IP. The Apollo embedded database engine is the underlying low-level technology that is responsible for reading, writing, and updating the DBF/Xbase database files, indexes and memo files. It is included with Apollo Embedded and Apollo Server. The database engine consists of several small SDE*.DLL files that total under 1MB in size, and which may be freely deployed with your applications. Developers are not expected to use the Apollo database engine directly. Instead, use the Apollo Embedded components which seemlessly wrap the engine's API, to develop applications. 1. What am I paying for when I buy Apollo Server? Apollo Server is a stand-alone application that may deployed freely with your Apollo applications. 2. Can I install Apollo Server on multiple machines? 3. Do I have to purchase additional licences or pay royalties when I distribute Apollo Server?